Hello Classmates, I've reached that half a century mark by the will of God. There are so many of our young folks dying before they become adults, have children or get to see their children's children. Everyday we open our eyes to see another day, we should give God the glory. Everyday, we get to see our family, i.e., children, sibling's, parents, grandchildren or friends. We need to be grateful! I guess what I'm saying is; We've all learned to value the wrong things in life. We are taught to value objects like money, cars, houses, fine clothes etc,. What we really need to value is love. Love from family and friends. We are gifts to each other, gifts from God! We love to be in the company of family and friends. That is where most of us feel safe, loved and happy. Enjoy each other now. Life is short. Those other things will always be here. In fact, you are rich when you are in the company of family and friends. We are gifts to each other from GOD... Thanks for making me rich by being my Gifts!! If "He" did it for me, "He" will do it for you too! Darlene Robertson Childs has a birthday today. 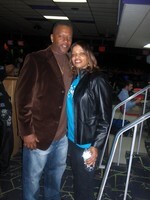 Darlene & Hubby Michael Chillin at the class of 79 bowling party.